Community quilt #41 was a very busy ‘I spy’ (or ‘eye spy’) quilt. 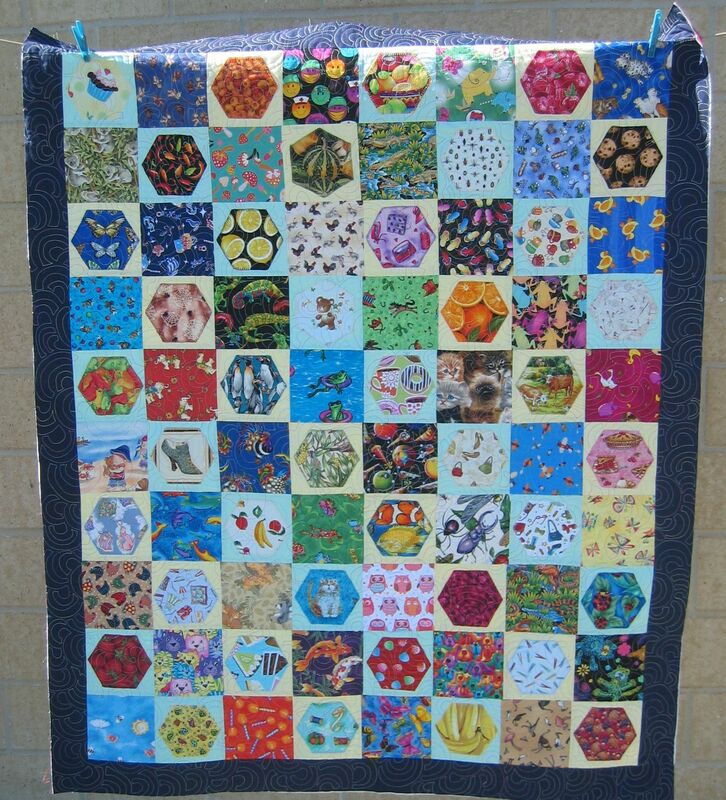 An I Spy Quilt is made from fussy-cut fabrics, usually children’s prints and novelty fabrics with motifs that the recipient can ‘spy’ when looking at the quilt. This one had everything from kittens to spiders, pegs to lemons, and everything in between! It was very ‘busy’ visually, and had every colour under the rainbow in it. 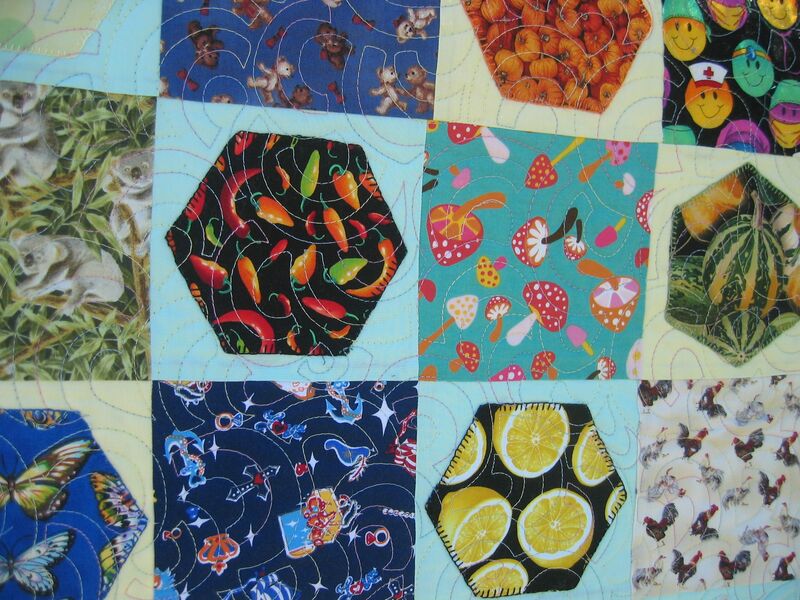 The fussy cut pieces were hexagons, and most were on a pale blue or pale yellow background fabric. These blocks were separated by other novelty fabric blocks, and the whole top was bordered with a plain navy fabric. 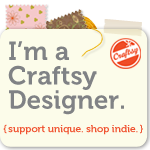 How to quilt such a busy quilt? I thought of doing outline stitching around the motifs as I did for the lolly jar quilt, but I decided against this fairly quickly after examining some of the motifs more closely. I thought of the open headband motif — quick, easy; or a large all-over stipple. Then I decided to do a variation of the open headband motif — instead of points at each turn, I decided to square them off, giving a geometric look to the quilting. 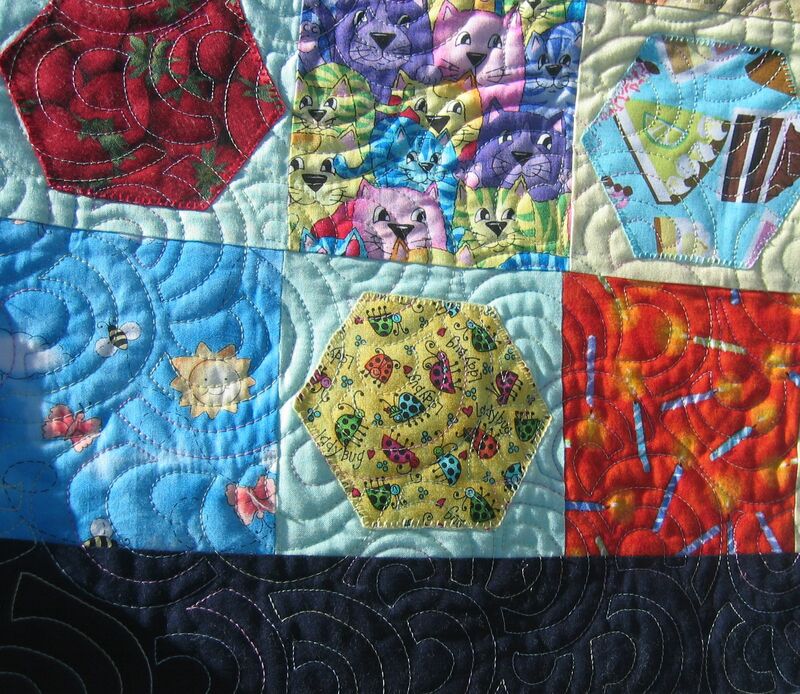 As there were so many colours in this quilt, I used a pastel variegated thread to blend in with many of the fabrics. I also extended the stitching into the border as I didn’t want yet another different motif to draw the eye — there was already enough going on in this quilt!